When the mercury rises, the Mercury Orchestra shows up at Sanders Theater. Since 2008, the ensemble has comprised volunteer musicians from other orchestras—the Lexington Symphony, the Boston Civic Symphony, the New England Philharmonic, for example—that have the summer off. Under co-founder and music director Channing Yu, Mercury plays once or twice each summer, focusing on big works from the romantic and early-modern repertoire: Mahler’s Second, Fifth, and Sixth Symphonies, Brahms’s First and Third, Berlioz’s Symphonie fantastique, Tchaikovsky’s Pathétique, Stravinsky’s Rite of Spring, Ravel’s Daphnis et Chloé. Last month, it was Prokofiev’s cantata Alexander Nevsky and the Shostakovich Tenth. Friday evening at Sanders, perhaps hoping to mitigate 95-degree weather, Yu and the orchestra remained in northern climes, starting with Rimsky-Korsakov’s Russian Easter Overture, moving to Scandinavia for the Grieg Piano Concerto, with 14-year-old Raymond Feng, and Sibelius’s Symphony No. 2. It was a thoughtfully chosen program: all three pieces express awe at the power of nature, which by the end has become a source of national pride. Composed in 1888, the same year as Sheherazade, the Russian Easter Overture—whose Russian title is Svetly Prazdnik, or “Bright Holiday”—draws its themes from the Obikhod, a collection of polyphonic Russian Orthodox liturgical chants that goes back to the 16th century. In his autobiography, Rimsky-Korsakov wrote that he was attempting to reproduce the “transition from the gloomy and mysterious evening of Passion Saturday to the unbridled pagan-religious merrymaking of Easter Sunday.” Even in the 5/2 opening Lento mystico, you can hear anticipations of the “violent Russian spring” that Stravinsky would describe in Sacre, and I wonder whether the piece didn’t inform the Easter poems of Boris Pasternak’s Yury Zhivago. This orchestra, which I had never heard before, can certainly play. The descending five-note figure (“Let God arise”) that starts the piece off was a little tentative. There were places where things didn’t quite crackle; attacks were soft, and so were the accents in the Allegro agitato (“Let them also that hate Him flee before Him”). But the brief cadenzas and solos from concertmaster Hyunsu Ko and principal cellist Josh Packard (who introduced the “An angel cried out” theme) were sweet and satisfying. And the orchestra grew into the piece: when it went full blast in the big chugging melody that surely represents the merrymaking, the effect was satisfyingly celebratory rather than raucous or clotted. Rimsky-Korsakov’s imitation of bells, reminiscent of Mussorgsky’s, was well-served, and the brass in the closing “Christ is risen” theme reminded us that Russian Easter is like no other. My benchmark for the Grieg Piano Concerto for 55 years has been the 1947 recording Dinu Lipatti made with Alceo Galliera and the Philharmonia: a patrician, indomitable reading that engages the Norse gods. 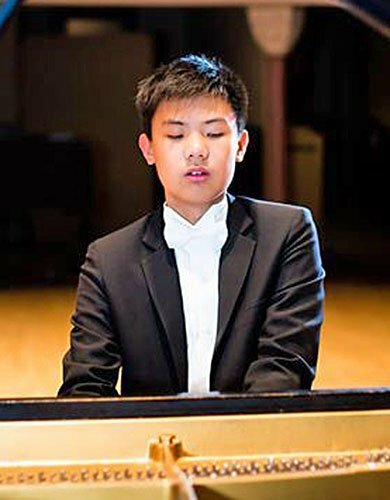 I hardly expected as much from Feng, the winner of the 2016 Chinese Performing Arts Foundation Concerto Competition, but his opening flourish, firm, weighted, a touch impulsive, suggested he would be more than just a teenage virtuoso. He didn’t assert himself straight off. The Allegro molto moderato first movement began as a small-scaled, almost polite affair, with long lines and a straight-faced delivery from the orchestra. Perhaps this was Yu’s conception rather than Feng’s. In any case, when he reached the big cadenza, Feng let loose with fireworks that were interpretative as well as pianistic, with fearful suspense in the bars leading up to Thor’s thunderbolts. The Adagio had both passion and poetry, Feng’s cut and thrust conjuring Rachmaninov. The energetic hallingdans finale went at a steady 2/4, with a melting trio from Feng; the Andante maestoso peroration, where that lyric trio melody becomes a song of triumph, was almost too grand. For the Sibelius Second, I relish four recordings by Paavo Berglund, all quite different; he invokes the Finnish forest spirit, Tapio, that the composer later celebrated in his tone poem Tapiola. Berglund’s Sibelius is a continuing process of transformation and evolution (as opposed to mere development), glints of redemptive light emerging from the tragic shadows. By contrast, Andris Nelsons’s recording, live from his first season as BSO music director, is all crisp sunshine, and the more mysterious for its objectivity. It is a difficult symphony, whether you’re analyzing or conducting. Sibelius begins the Allegretto first movement with fragments, puts them together, takes them apart; there’s no simple order of first and second themes. Yu built powerful climaxes, paragraphed with pregnant pauses, and conveyed the composer’s obsessive hysteria. Overall the reading was exuberant, and lush—this was a large orchestra, with 73 strings. After a while, though, the climaxes began to pall. And Yu was less effective in the ebb than in the flow: phrasing could have been more incisive, the hairpin dynamics of the Andante’s opening pizzicato section didn’t fully register, and neither of the first two movements quite subsided the way I think Sibelius meant them to. The Vivacissimo offered nimble scurrying and a nicely lilting trio at a much slower tempo—Sibelius did mark it “Lento e suave.” There wasn’t much tension in the ponderous buildup to the finale, however, in part because the ostinato strings were too loud and too literal. And despite the heroic efforts of the brass, the closing bars didn’t surge. Yu conducted with both baton and score, in a contained style that was pleasing to watch but tended to elicit a contained response from the orchestra. First and second violins were contiguously grouped—it would be a lot to expect antiphonal seating from a summer orchestra. My interpretative reservations aside, Yu got first-rate playing from the band, the program was splendid, and Feng is a pianist to watch. If Mr. Gantz wishes to experience a summer orchestra playing with antiphonally-divided violins, he may find Mercury’s own recording of Petroushka and Symphonie Fantastique to be interesting. I could not say if it reflects what the audience heard that evening, but it runs over ground familiar to those of us who were on stage at the time. Maestro Yu may be able to provide a longer list of works where he opted for that seating arrangement. I have played in the viola section of the Mercury Orchestra for the past five years. This is the best-written, most cogent concert review I’ve seen in a long time.